The first issue of the ‘Caroline Newsletter’. 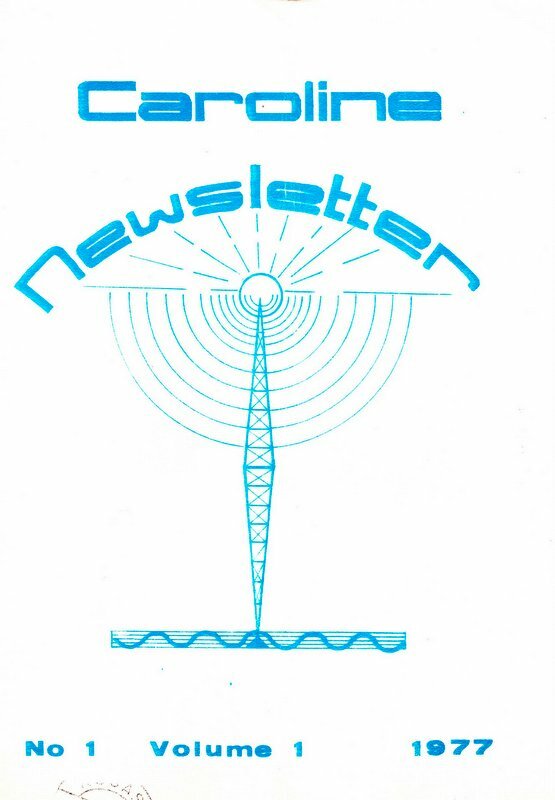 In 1977 Radio Caroline began publishing a magazine, the Caroline Newsletter. The first issue contained this article by DJ Ed Foster in which he described the dramatic events of September 1976 when the mv Mi Amigo lost her anchor and became grounded on a sandbank. It was the 11th September 1976, a lovely, clear and sunny day. Nevertheless, the wind blew strongly until by afternoon we were having dirty weather. The tractor tyres (suspended over the sides by chains to act as fenders when the relief tender comes alongside) were being washed up on deck by the waves that broke over it. The Captain ordered everybody to wear lifejackets. Peter Chicago loved those big seas. Waves hit the hatches with such force that water spurted through the door linings but Peter dodged from porthole to porthole taking photographs of them. There was 3 inches of water in the mess room and every time the ship rolled it cascaded down the stairs into the larder. Soon, disaster! One extra-large wave smashed a porthole. Marc Jacobs*, a Mi Amigo DJ, escaped being gashed by glass by a hairsbreadth but got a soaking. The Mi Amigo studio was swamped and its equipment and mixers drenched with sea-water. Mi Amigo was off the air! Caroline carried on but we had to use tapes because the record needle-arm danced a hopscotch over our selections. By dusk, all the cabins on the weather side of the ship were inches deep in water. Every joint and crack around the hatches and portholes spurted water. The constant pitching and tossing for so many hours was tiring and I decided to roll up in my bunk until it was time to put out my programme, which was from 6-9pm that evening. But I was soon awakened by a loud clanging and Tom Anderson came down to warn me the ship was adrift and the crew were lowering the spare anchor. This anchor didn't hold either and while I was on the air we began to drift again. Presently, there was a bump that made the whole ship shudder. A few minutes later, the Captain told me to broadcast to shore requesting assistance. The Captain is the man in charge and I'd repeated the message twice before Peter Chicago stopped me. We were in no immediate danger. But the continual bumping caused the ship to slowly swing around in the Force 8 gale and now its dry side began to take the big waves. All the other cabins were soon flooded and all hands were called down to the library to stack the records from the lower shelves on higher racks. We splashed around in ankle-deep water that sloshed from one side of the room to the other like a tidal wave when the ship rolled. Eventually, during my programme, the feeder from the transmitter to the mast cross-bar was snapped off by the wind and then Caroline too was off the air. The Skipper became anxious. We were bumping heavily on the sandbank. He ordered everybody to prepare their hand-luggage. Later, when the relief tender from Spain reached us, he took it for granted we would all abandon ship. In truth, he and the Dutch crew were surprisingly anxious to get away. Perhaps they didn't like the weather, or perhaps they feared being towed into a British port where the handcuffs were waiting. They were astonished when Peter Chicago (engineer), Mark Lawrence, Tom Anderson and yours truly stated we would remain aboard but nobody hung around to dissuade us. In fact, they disembarked so hastily they left the Dutch cook behind and had to put back for him. So there we were, the only four Britishers aboard now left in sole command of Mi Amigo. Three DJs and an engineer! We were either crazy, as the Skipper suggested, or heroes. But we didn't feel brave. We were simply doing our job. If we'd abandoned ship it could have been claimed for salvage and towed away by the coastal authorities. Also, although we didn't know it at the time, without us aboard, the ship would have sunk. It was then that the generators failed. Every light aboard went out. That was distinctly off-putting! We gathered-up our emergency travel-bags, grasped the life-lines and pulled our way along the deck to the bridgehouse with the sea surging knee-deep around us. The bridge is the highest part of the ship and once there, soaked through, we could watch the seas swamping over Mi Amigo's waist until the ship's deck disappeared from sight, making us feel that our bridgehouse was an island, much too low-down and close to the sea for comfort. The tender was standing off. We could see its lights. Once during the night it hailed us. Did we want to come off? We said No! A shore-station radioed asking if we were in need of help. Again we answered No. And then Peter pluckily made his way to the generator room, tinkered around and coaxed the light-bulbs to glow dimly. But it seemed to us then that the ship was all lit up and as bright as a Christmas Tree. We dozed away an uncomfortable night on the bridge and as dawn approached the seas began to diminish. Again our tender came close and offered to take us off, in the process colliding with our stern and knocking a great hole into one of the cabins only five feet above the water line. We refused the offer, the tender chugged away and as the sea calmed, we set about cleaning up and drying out. By evening the sea was as calm as a lake and I was taking the watch alone while the others caught up on their sleep. It was good to solemnly pace the deck, knowing I was in command and shouldering full responsibility for the ship and everybody aboard. I was in COMMAND! That made me feel like Captain Hornblower. When a light aircraft flew over and circled around a number of times I almost ordered my gunners to shoot it down. But then I saw a large vessel approaching and I sounded the alarm to bring all hands on deck to repel boarders. It was an official ship which anchored a mile away. It put off a small boat and its crew of four approached us carefully, taking soundings all the time. Its officer asked us if we needed assistance of any kind and we answered we're okay and thanked them for their courtesy. But we knew that if the ship had been deserted they would have boarded it and claimed it as salvage. Nevertheless, to show L.A., we gave a crewman a bottle of whisky. But the officer was in radio contact with his ship and told us his Captain forbade them to accept the gift which was unhappily returned to us by the disgruntled crew. It seemed to us to be an unnecessarily strict enforcement of discipline. The next few days the four of us were too busy to be bored. We mopped out everywhere, dried out the cabins and the blankets, and made everything shipshape. We couldn't fix the feeder and resume broadcasting because it was a welding job. But we'd sprung a leak which was flooding the transmitter room. For some hours we hauled buckets until Peter rigged up a pump. This was kept going night and day. But the hose had no filter and we were continually wading around, cleaning out the paper and muck that choked the hose. A very nasty and messy job, but one which prevented Mi Amigo taking in enough water to burst her seams and sink her. But it wasn't all work. We had the run of the ship and the larder. We fed like kings. The weather was fine and while we relaxed and ate on deck in the sun, we could look at the unsubmerged crown of the sandbank. It was so close we could have taken a running jump and landed upon it. Eventually, two tenders arrived bringing back the Captain, crew and DJs, as well as a reserve Captain. Mi Amigo by then was looking as spick and span as it could ever look. The result of our labours! But to our disgust, nobody gave us credit for it, nor a thank-you. They were all too busy helping with the unloading of a spare anchor, and the tow back to our original anchorage. Then, as soon as the feeder was welded back in position, we were in business again and Caroline was on the air once more after a silence of almost a week. I hope nobody will condemn us four for feeling chirpy but it is a fact that the only British blokes aboard were the four that didn't desert the ship! * Marc Jacobs' name was given as MIKE Jacobs in the original article. Back to Radio Caroline in the Seventies, part seven. and one from the sixth edition here.